1) Awesome, large-scaled planters. 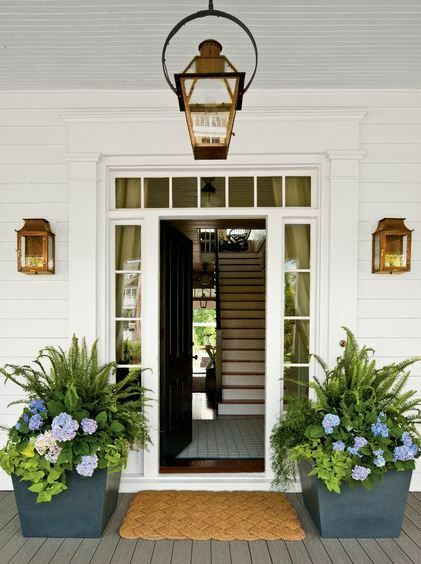 Ferns + hydrangeas = eye-pleasing arrangement. And the heft really makes them statement pieces. 3) Copper lanterns. Especially the wall-mounts with the slight pagoda nod. 4) Transom windows above a stately door. 5) Door's moldings in general. One day, one day, I hope to have a lovely entry like this. Nothing crazy...just something classic and welcoming. Daniela I love this entry so much. As you have mentioned it has so many of the elements we both appreciate!